Ever try to drink out of a fire hose? Me neither, but I'd imagine that it might feel a little bit like trying to keep up with all the news that's pouring out about the PlayStation 4. For the sake of anyone who prefers to drink their news in a slightly more dignified manner, here's everything we've written about the PlayStation 4 so far, all in one place. I've broken our articles into a few categories. THE STUFF: Articles about, you know, the stuff. The physical stuff. THE TECH: Information on the tech specs and other capabilities of the system. THE GAMES: Yes! The PS4 is for playing games! THE JOKES: Plenty of jokers, some of them here, have already had a laugh. THE REACTIONS: All manner of responses to what Sony showed, and did. OUR THOUGHTS: Any analysis we've done. 2/28 update: Now with more articles! Why Didn't We See The Actual PlayStation 4 Tonight? Sony's Boss Explains. Why Didn&apos;t We See The Actual PlayStation 4 Tonight? Sony&apos;s Boss Explains. So, I Guess We're Supposed to Just Imagine the PS4? So, I Guess We&apos;re Supposed to Just Imagine the PS4? Goodbye Fantasy PlayStation 4s! It&apos;s Been Fun. We've been speculating and spilling them for months, but Sony has finally revealed, at least partially, the basic spec sheet for the PS4. It's... very basic, but as you can see, there's 8GB of memory, a hard drive and an x86 CPU. It had been speculated for a little while, but Sony just made it official: a big part of the PlayStation 4 will be a "share" button, that plays a big part not just on the dash and in your games, but in the way your friends lists are managed as well. Quantic Dream's David Cage has taken the stage to reveal a new engine his studio has come up with for the PlayStation 4, claiming that a stunning model of an old man's head-as detailed as those found in CGI films-was running in real-time on Sony's new console. 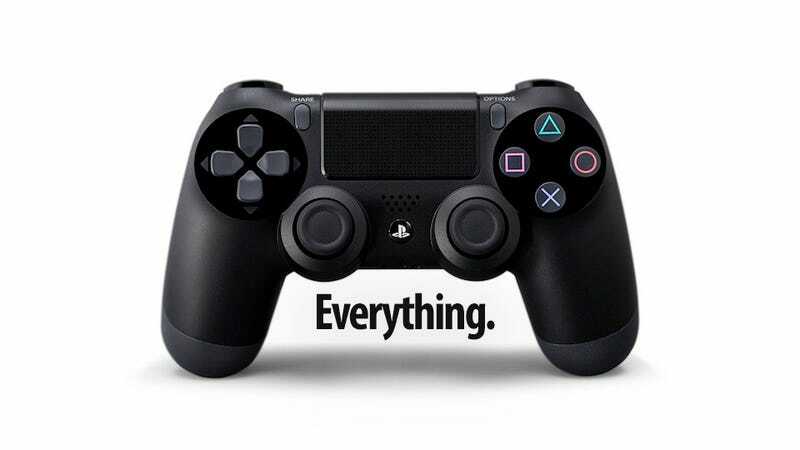 The PS4's new controller-officially dubbed the DualShock 4-is going to be working in tandem with a new camera, called the PlayStation 4 Eye. Stemming fears of the always-online requirement still rumored strongly for the next Xbox, a Sony PR rep confirmed to Kotaku that: "PS4 games will be playable without an Internet connection." Knack Is The First Announced PlayStation 4 Game. Here's Some Footage. Knack Is The First Announced PlayStation 4 Game. Here&apos;s Some Footage. It shouldn't be too big a surprise, seeing as a Killzone game helped sell the last PlayStation console launch, but in case you didn't see it coming, Guerilla Games revealed a new Killzone game today for the PlayStation 4. Watch Dogs Will Be Out On PC, PS3, 360, And Wii U. But First It'll Be On PS4. Watch Dogs Will Be Out On PC, PS3, 360, And Wii U. But First It&apos;ll Be On PS4. The Witcher 3 Is Coming to the PS4. It'll Be Out Next Year. The Witcher 3 Is Coming to the PS4. It&apos;ll Be Out Next Year. Open world role-playing game The Witcher 3: Wild Hunt is headed to the PS4, the game's developers revealed today. And boy do they seem excited! The Last Guardian should be out by now. It's not. It could have been shown off at the PS4 unveiling. It wasn't. Fans looking forward to the game have every right to wonder what the hell is going on, then, and to them, Sony Worldwide Studios boss Shuhei Yoshida would like to say he's sorry. The future is here! It&apos;s tech that beckons you with a piercing gaze. Look. Go on. Do it. Two decades ago, Sony and Nintendo were prepared to partner on a CD-ROM drive for the SNES. Things went sour. The deal fell apart. And Sony went their own way, eventually launching the PlayStation and paving their own path to success. Next Media, the Taiwanese news team now internet-famous for their bizarre animated sequences, have today turned their attentions towards the announcement of the PlayStation 4. Sure, it was fun to watch today's PlayStation 4 reveal from the comfort of your own home. But that was while it was going on. When it ended, the cameras cut away. What Did You Think Of The PS4 Announcement? In place of tonight&apos;s off-topic post, I thought I&apos;d turn it over to you guys. In place of tonight's off-topic post, I thought I'd turn it over to you guys. Sony's PlayStation 4 reveal earlier this evening was one of the stranger console announcements I can remember. Sony's Wildest Plans For The PS4: How Likely Are They? Sony&apos;s Wildest Plans For The PS4: How Likely Are They? Last night, during the big PS4 conference, Sony brought Gaikai's David Perry on stage to deliver some lofty promises for the new gaming console. I went to Sony's over-hyped 2006 press conference and they showed the world a version of the PlayStation 3 that we never quite got. And so last night, I went to Sony's 2013 PlayStation 4 press conference wondering what new ways they'd planned to trick me. And that's that. Everything we've written about the PlayStation 4. I have a feeling there will be more! But that's what we've got so far.